Stacey has been involved with horses since the age of 12 and has a wide range of experience with many types of disciplines - dressage, jumping, eventing, western trail, jousting, equestrian vaulting, working equitation and back woods mountain trail riding. Stacey graduated with a degree in Equine Science as well as a degree in Veterinary Technology from Purdue University. While living in the Midwest in 2001, Stacey was first introduced to mounted archery when she joined the SCA (Society of Creative Anachronism). After Stacey moved to Utah in 2005, she never got to shoot from a horse again until the summer of 2012 when she took jousting lessons and mounted archery was also included. Stacey was hooked and she started planning a way to be able to spend more time at mounted archery. She did not even realize at that time that mounted archery was an actual sport! It took several years to be in the position to have the time and horses but as soon as she could, she began training a few of her horses on her own for the sport. Stacey made her own targets, experimented with bows and practiced whenever she could. ​When practicing mounted archery in 2014 and 2015, various horse folks would watch and interest started to grow. It was evident that there was a lot of interest as more and more folks asked how they could try this cool “new” thing, so Stacey got some of these horse friends together to learn to shoot arrows from a horse. Even though she was not thinking to start the Alpine Mounted Archery Club until the spring of 2016, interest flourished as more and more people wanted to try mounted archery in the summer and fall of 2015. Being the President of the Utah Dressage Society and trainer and lunger of the Wasatch Peak Vaulting Club, Stacey is very familiar with running an equestrian club so it only seemed natural to move forward with opening Utah's very first mounted archery club! Stacey is currently level 1 registered instructor through the MA3! ​Erika grew up practicing archery with her Mom, and dreaming of owning a horse. Early on, she became fascinated with the horse cultures of Asia and Western Europe - especially the mounted archery aspect of it. Erika worked her way through college in a costume shop, and at the Triangle C guest ranch as a children’s counselor and archery instructor over the summer. The idea of being able to do archery, ride horses, and continue costuming greatly appealed to her. ​When she got her first horse, a rangy little mare named Charface, she knew mounted archery was what she wanted to train her for. She laughs at having to shoot with tennis balls on the tips of her arrows since where she boarded her horse, they would not let her shoot any other way! Erika would aim her arrows into a hole she cut out in the side of the barrel! She is now very happy to be able to practice on a real course, with real targets and without the tennis balls! In addition to horse archery, she also enjoys illustration and creative writing, and spending time with her husband and family. She loves teaching and helping others succeed, and will nerd out with anyone over horse color genetics. Erika loves the traditional mounted archery and she is going to be an integral part of the start of the new club startup! Beverley has been an integral part of the Back Country Horseman's Club for many years and is an avid horse woman. Beverley was one of our very first members and voted in as an officer June of 2016. Tiffiny was one of our very first MA3 members from 2015! Tiffiny and her family love to ride horses and they also love mounted archery! Two daughters of hers are experienced horse archers and compete in multiple competitions per year around the country. 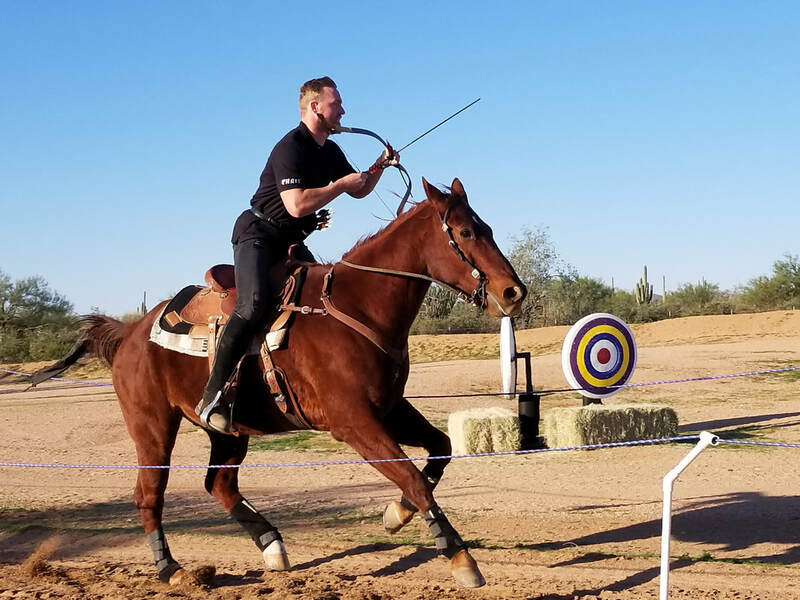 Chris first attended a clinic of ours in the spring of 2018 with 6 years of archery skills and nearly zero experience on horseback. His fearlessness, competitiveness, and his drive for growth helped him grow. Needless to say, he immediately fell in love with the sport. As a kid, horses fascinated him and always wanted to learn how to ride. Due to various limitations, he just wasn't able to until adulthood. Jim Franson is an expert bowyer and arrow maker and we are lucky to have this wonderful resource! Jim is an expert archer and is learning the sport MA. He is very interested in developing lesson plans and safety rules for our club.